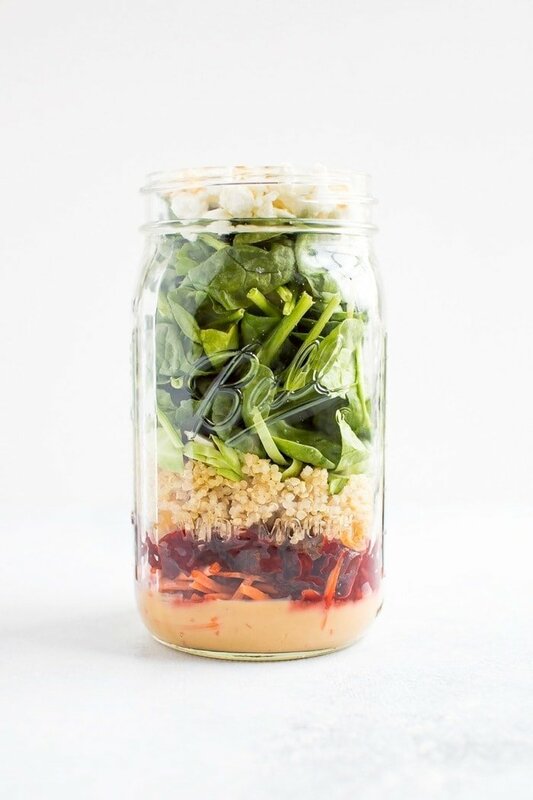 This beet power salad can be meal prepped two ways: in a mason jar or a meal prep container. 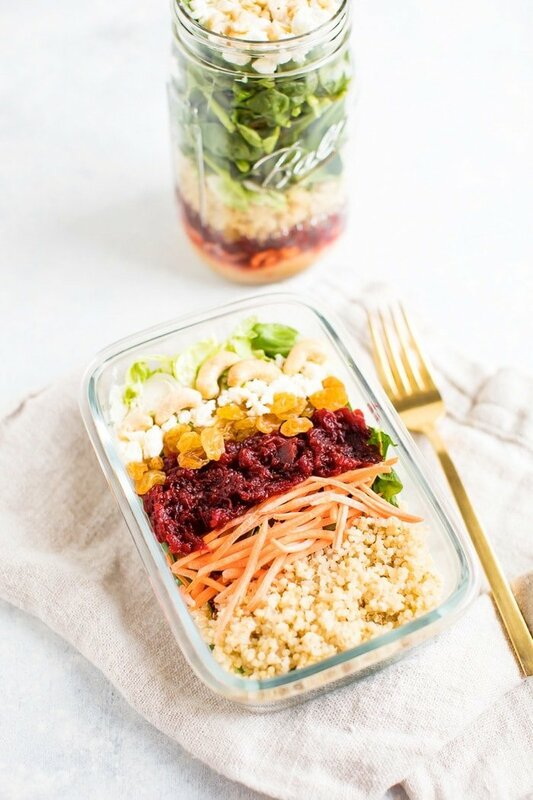 You’ll love the combo of beets with crunchy carrots, shredded brussels sprouts, quinoa and creamy goat cheese. Vegetarian + gluten-free. It’s day two of salad week. How many of you made a salad yesterday? I hope you’re jumping on the #saladeveryday train because it has really made a difference in my life! Without a salad, I feel like I’m not getting enough veggies and honestly feel a little sluggish. I was at a bachelorette party in Austin, TX, this past weekend so it feels extra good to be focusing on nourishing salads this week. For someone who isn’t super adventurous with their vegetables or flavors this salad might look intimidating, but trust me on this one… you have to give it a try! If nothing else, promise me you’ll try the zesty tahini dressing because it is the bomb.com. I know I’m biased, but it’s true. 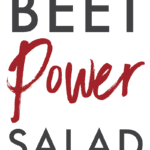 I almost decided to add “earthy” to the title of this salad, but I thought that might scare some people away even more than the combo of veggies so I went with beet power salad. 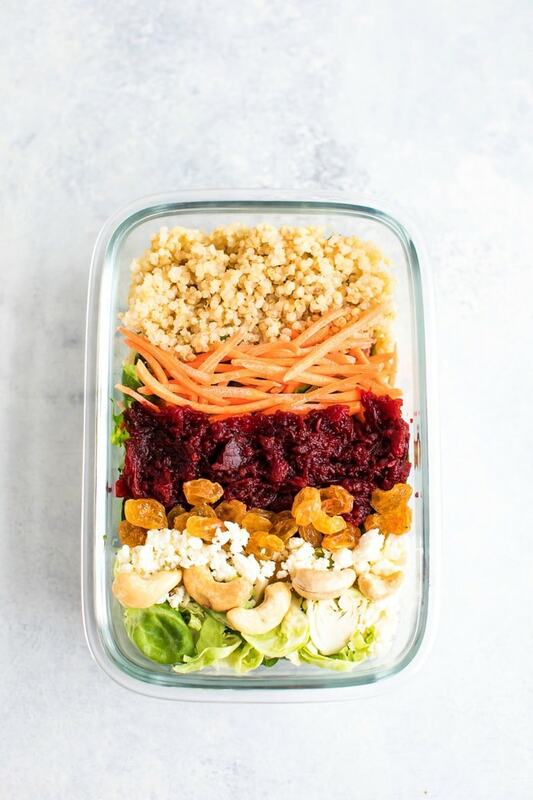 That said, I love the earthy taste of beets and they’re delicious in this salad paired with crunchy carrots, shredded brussels sprouts, creamy goat cheese, cashews and the golden raisins for a hint of sweetness. 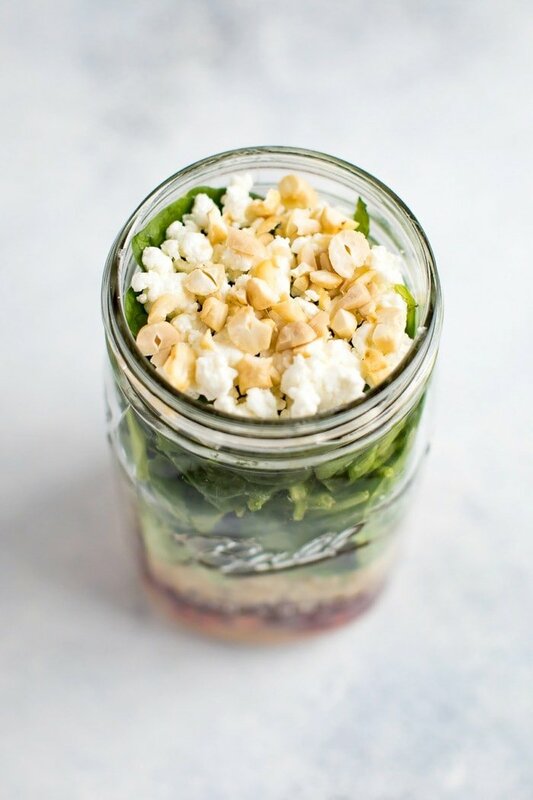 For this salad I’m giving you instructions for how to meal prep it using mason jars or meal prep containers. Either option works great! 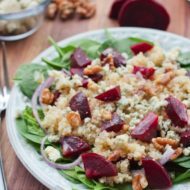 I love using Trader Joe’s pre-cooked beets for this recipe. I’ve seen a lot of grocery stores carrying pre-cooked beets in their refrigerated section but Trader Joe’s has the best price I’ve seen. If you don’t have time to peel and cook your beets, buy these! Buy pre-shredded carrots and brussels sprouts! Again, Trader Joe’s sells these but I’m sure most grocery stores do too. This saves so.much.time. Instead of washing, peeling and shredding I literally just open the package and dump. Winning! You could also dump full carrots and brussels in your food processor to give them a quick chop if you can’t find pre-shredded. If your vegetables aren’t chopped or shredded already, prep them! 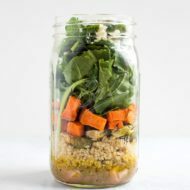 For a mason jar: Add 2-3 Tablespoons of dressing into a large, wide-mouth mason jar, then start layering ingredients in this order: carrots, beets, raisins, quinoa, brussels sprouts, leafy greens, goat cheese crumbles, cashews. 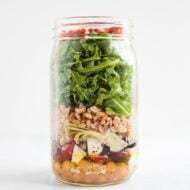 For a meal prep container: Line bottom of container with leafy greens and layer all ingredients in columns/sections on top. Store dressing in a separate container. You can absolutely meal prep more than one salad at a time. Just double, triple or quadruple all the ingredients except the dressing. The dressing already makes about 3-4 servings. 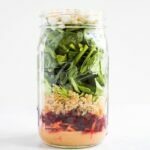 Want more meal prep salad ideas? Check out this chicken avocado club salad. This would be good using raw, spiralized beets too! Looking forward to trying this! Excellent salad! I shredded the beets without cooking them to save a step (and because I like raw beets). I also used pepitas instead of cashews because I was trying to use up an open bag. Overall this is a keeper!